The board has scheduled 3 events to get to know and hear from Eliot Neighbors. These community conversations will help set priorities for projects that Eliot neighbors care about most. It is the ENA Board’s job to make decisions on issues that come up for the neighborhood. It’s their responsibility to represent all the neighborhood people when making decisions. They need to hear what folks have to say. 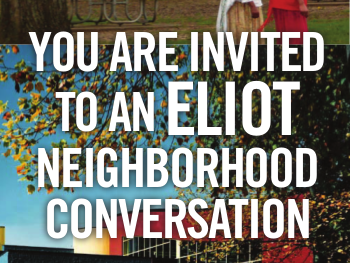 Come be part of Eliot Neighborhood’s future. Imagine a neighborhood where people know each other and work together to benefit the community as a whole. What would it take to get there? ELIOT OPEN HOUSE Wed. October 8 6:30-8:30 PM and FREE RAFFLE! Help spread the word, and bring your neighbors! At this Open House, the intent was to have neighbors meet; capture comments and thoughts about issues and situations to begin the conversation of what is important for the community that the board should focus on in the coming year. The process continues with the Survey and a second conversation event Oct 22, same place to gather and discuss ideas. The last conversation, Nov 5, event will be to prioritize the ideas into actionable plans. Also, if you follow this link, you can participate by adding your opinions and comments to the ENA Conversation Survey https://www.surveymonkey.com/s/6GCD7DW Once you’ve completed the Survey and submitted it, you can see the compiled results of all who have taken the Survey. I was sorry I wasn’t able to attend. Can you please leave what was discussed on here?